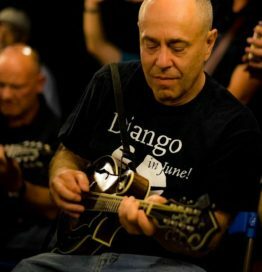 This will be year two for Dave Gross as a teacher at Django in June. But Dave has been attending the event as long as anyone—since before it even became a week-long music camp in 2007. That alone makes him one of the best-informed mandolinists in the country when it comes to Gypsy jazz. He’s seen all our artists come through, heard all the repertoire, jammed on it for countless hours, and worked with every mandolin instructor we’ve hosted—Will Patton, Jamie Masefield, Jason Anick, Paul Glasse, Tim Connell, Aaron Weinstein, and the gentleman he’ll be working alongside this year, Don Stiernberg. When not fixated on his Django obsession Dave plays bluegrass straight-up with Blue Plate Special, or gives it a Hip Hop twist with Gangstagrass. A fortuitous stint with Steve Liesman and the Mooncussers not long ago landed him onstage for a show with the Grateful Dead’s Bob Weir and The Red Rocker, Sammy Hagar. A fortuitous stint with us this summer is going to land you the chance to ask him all about it. You’re not going to meet anyone more eager to share.